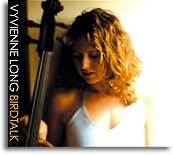 Vyvienne Long played in Cyprus Avenue last Thursday night and Max Greenwood provided support on the night. Max was pretty good; he played the keyboard and sang some mellow songs. Shortly after he left the stage Vyvienne Long and her band made their way onto it. Vyvienne sat in the middle of the stage at the front and was flanked by two cellists. In addition to this there was a drummer, a bassist and a guy on keyboards behind Vyvienne and the other two cellists. Vyvienne played a number of her own songs including a delightfully quirky song about a guy on the motorway taking heroin and another one entitled ‘She can’t wait to get her hands on the inheritance’ with a vehement chorus of ‘it’s mine, it’s mine, it’s mine’. She also did some great covers with her own reworking of Pharrell’s ‘She wants to move’ and a nifty cover of The White Stripes ‘Seven Nation Army’ which was featured on the second Today FM ‘Even better than the real thing’ CD. Vyvienne seems to be quite eccentric (you know odd in a good way) and kind of reminded me of a character from a P.G. Woodhouse story. She has an EP out at the moment called ‘Birdtalk’ which you can pick up in HMV at the moment for €7.99 - it’s definitely worth a listen. Sorry I missed that gig too. # posted by Pure Cork Boy : February 01, 2007 2:30 p.m. Her version of Yoshimi by The Flaming Lips is excellent. Wish I had seen her that night too. # posted by Donal : February 02, 2007 10:59 a.m.